Exciting News - we are expecting a Montessori baby... GIRL! Sweet baby sister will make her grand debut this summer. We are thrilled to add a second child to our family and Little Bee is happy to welcome a future playmate. I have been working on our Montessori baby room complete with a pull-up bar, mirror, shelves for an infant, floor bed, mobiles, and more! I can't wait to show you her room and all the Montessori baby activities I have planned. For me this is the BEST part of "nesting" for a new baby - buying the frilly girl clothes, dreaming of holding her, and setting up her very own Montessori space. You can read more about a Montessori Infant Room here. 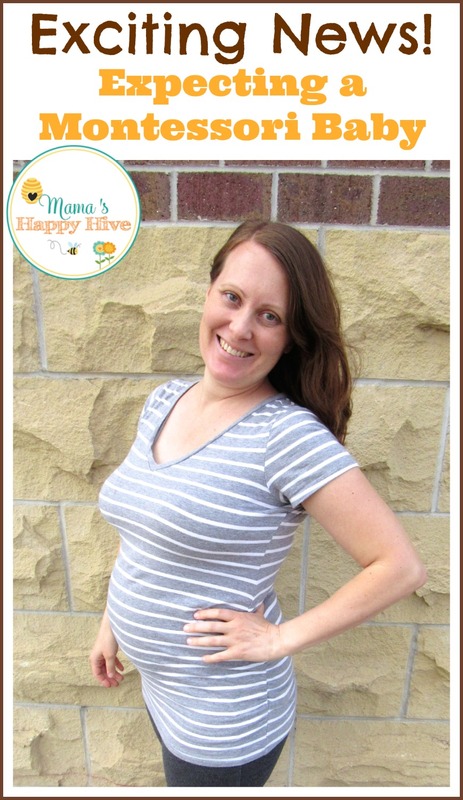 My goal on Mama's Happy Hive blog is to write two posts a week. One post is a collection of ideas (link party) and the second post is "play to learn" activities for toddlers and preschoolers (soon to add infant). If you have been following along, you will know that I mostly share the activities that Little Bee and I do each week in our homeschooling journey. You will find our Montessori Inspired homeschooling curriculum here. However, pregnancy is not the easiest experience for me. At times during my pregnancy, my ability to think has been challenged. I believe it is what people call, "Pregnancy brain." As a result, Mama's Happy Hive blog has been a tad bit quiet lately. I expect when our baby girl arrives, Mama's Happy Hive blog will be even more quiet for several months. Please hang in there with me, because I plan to return as soon as my sleep-deprived brain can think again. Honestly, I am nervous about postpartum depression which is mentally debilitating for a period of time. I had 8 months of postpartum depression with Little Bee. I am told that every postpartum experience is different, so I am hopeful that my experience with baby girl will be pleasant. To prepare for the postpartum blues, I have set up a variety of support systems to get through the first 6 months. I am hoping I can share my postpartum experiences with you and pray that my brain will function enough to allow me to write. Here I have compiled a list of baby posts that I plan to write during the next 6-9 months. I am really excited to share these posts with you and I am working very hard to put the "behind the scenes" information together. Please note: As these posts go live, I will update and add links here. I want to send out a SPECIAL THANK YOU to my loyal readers in supporting Mama's Happy Hive blog over the last year. Thank you from the bottom of my heart for following along with our journey! I can’t wait to see your Montessori infant room and read about everything else to come! This news are huge! Can’t wait to see all your new projects! Please don’t be harsh on yourself and work only in the limits of your abilities. We will understand everything. Congratulations to your family! Thank you Yuliya 🙂 I am also just as excited to see your baby posts! I didn’t really get to do “Montessori from the Start” with Little Bee, so I am excited to do that this second time around. I think you can still do a floor bed, but maybe not from infancy. I incorporated a floor bed with Little Bee once he could roll. Anyway, you do what works best for you and your children and it will be perfect! Hugs! What a fantastic list of upcoming posts! A rest/break is definitely understandable. It is wonderful focusing on the baby and bonding with her. Can’t wait to read more about this wonderful stage you are in! Congrats! Great blog.. I just love your little guy and your great sense of humor. Congrats!! Girls are just as fun as boys.